MINNEAPOLIS & REHOVOT, Israel–Stratasys Ltd. recently announced two new advanced materials for 3D printing. One, FDM Nylon 12CF, is a carbon fiber-filled thermoplastic that is available for Stratasys FDM (Fused Deposition Modeling) technology and is reported to be strong enough to replace metal components in a range of applications. The other, Agilus30, is a new line of high-durability flexible materials that are compatible with the PolyJet process and can withstand repeated flexing without tearing or deforming, Stratasys said in a press release. The FDM Nylon 12CF material is suitable for rapid prototyping; strong, light-weight tooling; and end-use parts. Containing 35 percent chopped carbon-fiber by weight, FDM Nylon 12CF is said to offer the best stiffness-to-weight ratio among Stratasys FDM thermoplastics, meeting functional performance testing demands in automotive, aerospace, recreational goods, and industrial manufacturing sectors. The material is expected to be of interest to design engineers that need to rapidly produce strong, light-weight, and rigid components for functional prototyping, thus reducing new product time-to-market; and to manufacturing engineers that produce manufacturing aids, such as jigs and fixtures, where high material stiffness and strength is required and there is great benefit to the significant weight savings over metal tooling components. FDM Nylon 12CF is also useful to design engineers making low-volume production parts with unique structural requirements, where high strength in one direction is required, the company said in the release. Utah Trikes, a beta customer, is taking advantage of the material's properties throughout its development and production process to make significant cuts to its product development times. "The excellent strength and stiffness-to-weight ratio of the FDM Nylon 12CF material is a game changer for us," said Ashley Guy, president and CEO of Utah Trikes, in the release. "It means we can prototype almost every part of our product on Stratasys FDM 3D Printers in under two weeks, where in the past, it could take us over two months. "I no longer have to constrain my designs because of prototyping limitations," continued Guy. "Now I can focus on designing better, more functional parts without worrying about how to shape the aluminum or how to lay up carbon fiber onto the molds. Stratasys FDM Nylon 12CF parts can be 3D printed faster, with superior stiffness-to-weight performance and with better repeatability than any other 3D printing technology or vendor we've seen." "We believe that the impressive strength-to-weight ratio of the FDM Nylon 12CF is transformative for many industries, from consumer goods and recreational goods to automotive and aerospace," said Zehavit Reisin, vice president and head of rapid prototyping for Stratasys. "It enables designers to develop more practical and functional designs and get them to market faster, without worrying about how to prototype those parts using metal or molding." 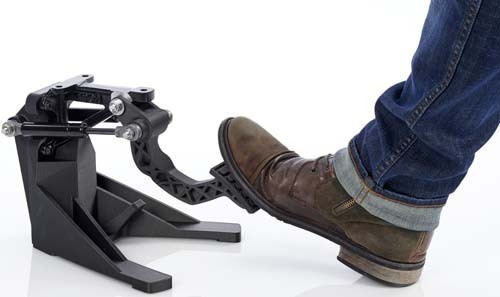 According to Tim Schniepp, Head of Tooling Solutions for Stratasys, "The very high stiffness-to-weight ratio of the FDM Nylon 12CF material makes it extremely well suited for a wide range of final part and manufacturing tooling applications where the combination of stiffness, strength, and low weight is critical to the performance. Examples include drill guides, end- of- arm tooling, brackets, jigs, fixtures, and even metal forming tools." Expected to begin shipping in Q2 2017, FDM Nylon 12CF is available for the Stratasys Fortus 450mc Production 3D Printer and is compatible with soluble support SR-110. It requires an updated version of Insight software and a hardware upgrade. The material can produce parts in a layer thickness of 0.010 in (0.254 mm), the company said. The Agilus30 family of materials, consisting of Agilus30 and Agilus30 Black, is created for designers and engineers that need to simulate flexible or rubber materials. The materials are said to enable greater freedom to handle and test flexible parts and prototypes while delivering superior accuracy, fine details, and enhanced product realism. The Agilus30 materials are well-suited for modeling delicate parts that undergo repeated flexing and bending, the company said. Their all-around rubber-like performance and compatibility with soluble support (SUP706) is expected to be of interest to mechanical engineers, RP managers, and industrial designers. Examples of applications benefitting from Agilus30 include over-molding, soft-touch and living hinges, and hoses, seals, and gaskets, as well as knobs, grips, pulls, and handles. Agilus30 can also be combined with additional materials to create a wide range of Digital Materials with varying Shore A values, shades, and colors. Agilus30 is compatible with Stratasys's Objet260/350/500 Connex1/2/3 3D Printing platforms and is now available for shipping.